Public-private partnerships (P3s) hold enormous potential to help cities foster innovation, increase efficiency and meet the transportation needs of tomorrow. In February 2017, SUMC held a webinar that brought together leading experts from both the public and private sectors to offer real examples of leading P3s and discuss what it takes to make such arrangements successful, from formulating ideas to structuring contracts and managing procurement. 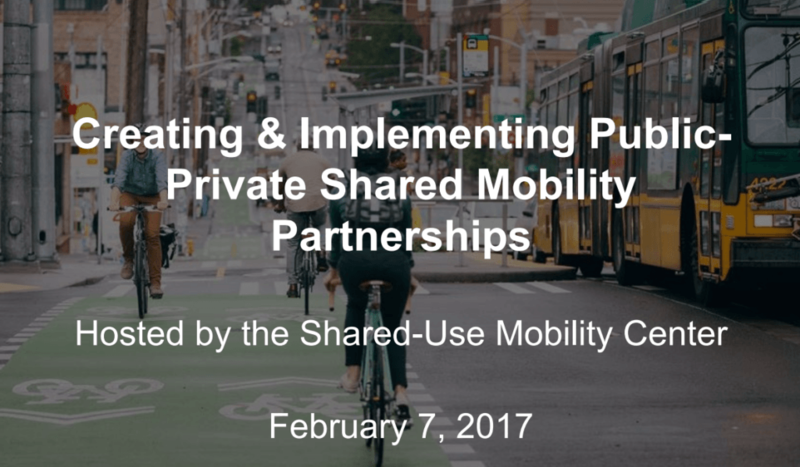 The webinar also covered ways that transportation and policy experts can use SUMC’s Shared Mobility Toolkit – which includes a policy database, benefits calculator and mapping and opportunity analysis tool – to dig deeper into P3s.